AMHERST, Mass. — Winless UMass had 550 yards of total offense and score 50 points, and it still wasn’t enough. 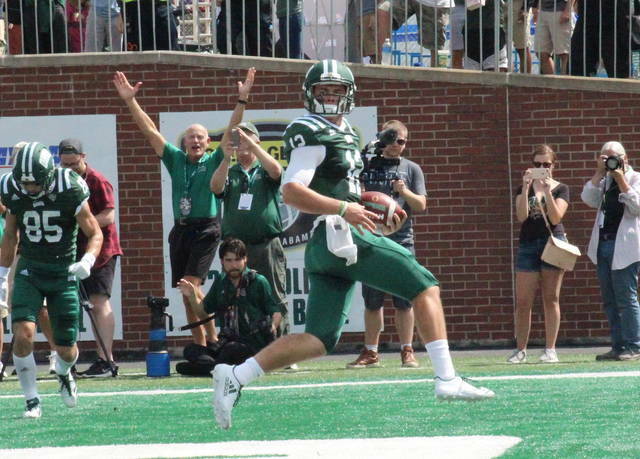 The Ohio University football team escaped the Bay State with a 58-50 on Saturday afternoon, as the Bobcat offense came up with 473 yards on its own. The Bobcats (4-1) ran for 292 yards and five touchdowns, while passing for 181 yards and two scores. With 12 carries and three receptions, A.J. Ouellette had 151 total yards and two touchdowns to lead the Green and White. Nathan Rourke was 13-of-24 passing for 181 yards and two touchdowns, while rushing for 113 yards and two more scores. Dorian Brown also ran for two touchdowns, chalking up 72 yards on seven carries, while Brendan Cope hauled in a team-best seven passes for 126 yards and one score. Bobcat place kicker Louie Zervos was 3-for-3 on field goal tries and 7-for-7 on point-after kicks. A complete recap of the Ohio at UMass game will be available in the Tuesday sports edition of The Daily Sentinel.